Hello, PlayStation.Blog! Corey here from Klei Entertainment with some exciting news. We are extremely happy to announce that Don’t Starve Together is coming to PS4 on September 13 along with a brand new bundle, the Don’t Starve Mega Pack, which will be 60% off for players who already own the original Don’t Starve! Since the launch of the classic single-player Don’t Starve on PS4, we’ve gone on to release two expansions, various themes, and now the multiplayer focused Don’t Starve Together. The Mega Pack will include the entire current Don’t Starve PS4 catalogue in one snazzy bundle full of survival and savings. On September 13, PS4 fans will be able to get everything shown in the list above via the the Don’t Starve: Mega Pack for $26.99. As a special thank you to PS4 Players who already own the original Don’t Starve, you’ll be able to get the Don’t Starve Mega Pack for 60% off it’s normal price at $10.79. This way you can save on the brand new multiplayer expansion and get any themes or single-player expansions you may not have yet. Thank you! One of the most exciting parts of this bundle is undoubtedly the release of Don’t Starve Together. This new entry in the Don’t Starve collection will support up to six players online and for the first time ever, support split-screen couch co-op both locally and online! We loved hearing stories about friends and families finding creative ways to share the controller while playing the original single-player Don’t Starve. From passing the controller every in-game day, every death, or simply at random, it was clear this was a game many people wanted to enjoy “Together” (See what we did there? ), on a couch. Now players will be able to survive together on the same couch, and even take their split-screen game online if they want and create or join an existing game to play with others. Thank you to all the Don’t Starve players who have been patiently waiting for an official release date on Don’t Starve Together. We’re really excited for everyone to jump in on September 13, and hopefully not starve. when ‘Don’t Starve Together’ release on steam i had friend to play with together, but thanks to it we are no longer friend. 10/10 would buy again. I’m excited for this game. I loved the first game. I love every game Klei’s made (except Eets, never played Eets), so this ia gonna’ happen. Also, please, please, please… Shipwrecked on Vita! Giant Edition was my GotY! Thanks so much! That means a lot to hear. I want my voice also heard for Shipwrecked and Don’t Starve Together on Vita! My Wife will be so excited! Is Don’t Starve Together free if you already own Don’t Starve? That was the deal on PC, correct? If you want your game’s expansions to be free…go play on PC. Yes it was on PC, however on PS4 DS was free on PS+ so it’s kind flipped on PS4. We still wanted to say thanks to everyone who got the first one thought! On PS4, If you own the original DS, even with PS+ for free, you will be able to buy the entire MEGA PACK for less than the normal price of just DST. I hadn’t seen this yet, thanks for sharing! We love hearing about parents and their kids playing this together. i’ve never played this game , but will definitely be picking this up for the co-op for sure.. thanks for adding that in.. Co-op games are a MUST. We need more support for local Co-Op games. I’m with you there. We are super excited for this feature for exactly that reason. We kept hearing about how people were finding creative ways to make the original game couch co-op, so we really wanted to make this happen for console. We’re super glad we could add this! Great game. Now I have to see if my kids want to play with me. Yes!!!!!!! Yeah!!!! This is awesome news!!! Time for the wife and I to spend some quality time! Couples finding creative ways to play the original multiplayer by passing the controller was a huge factor in us working to add solid online and offline couch co-op. Very excited it’s official and easy to do now! Great game and awesome support. I thought ‘Together’ would only be couch co-op, so very cool to know there will be online MP as well. I wasn’t going to buy this if it was only local MP, but definitely picking it up now! Just bought Shipwrecked a couple weeks ago and it is a nice expansion….just haven’t had much time to explore and die yet. So is Don’t Starve Together set in the base game location or can you survive together in Reign of Giants and Shipwrecked as well? Love the game and if it wasn’t for PS+ I’m not sure I would have ever checked it out, but I’m definitely a fan now! Thank you! We spent a lot of time working on Couch Co-Op for both online and offline play. You can have a friend over and start a game split screen, online, and have other people join you. If you or your friend quits out of split screen and goes home to their own console, you can pickup the same online game and keep going. As for content, at launch Don’t Starve Together is heavily based on the original “world” of Don’t Starve. It included all the same content / characters as the original DS / Reign of Giants, however it has all been tuned for multiplayer play and there are a bunch of new surprises specific to Don’t Starve Multiplayer, and a lot more are coming. We also have re-skinable characters in Together so you can both play as Wilson if you want and look completely different based on the skins you find from free drops / unlock in the game. Boom! I will own this! Don’t Starve on the PS4 and Vita are awesome! I still play them today! Please put this newest versions on the Vita too! Don’t Starve Shipwrecked and Don’t Starve Together would be awesome on the Vita with cross save and cross play! Thanks so much! We’re not sure if there will be more Vita development from us at the moment, but if anything changes we’ll let everyone know! I “own” the original Don’t Starve: Console Edition through PS Plus. Will that satisfy the ownership requirement for the discount on the Mega Pack? Indeed, as you released Don’t Starve Giant Edition on PS Vita, do you plan to release this version on VITA too ? It would be great ! No plans at the moment but if this changes we’ll let everyone know! It’s been a journey for your team! I can’t wait to play the final version of DST!!! The support for Don’t Starve has been amazing and we’re really amazed and proud at what it’s become today. We’re really happy that Don’t Starve Together is going to give us a lot of new things to explore with players in terms of future content and gameplay :) We’re already working on new things to bring to the world of DST for players to explore. If this comes to Vita, all will be well in the world. They didn’t include the price if you just want Together lol. What’s the standalone price? I’m betting something around 15-20 bucks. It’s only an expansion after all. Don’t Starve Together on it’s own will be $14.99 USD on PS4. If you already own the original Don’t Starve, we’ve made it so you can get the Mega Pack for 60% off at $10.79 which will complete your collection with everything we’ve released on the PSN for Don’t Starve including the two premium animated themes! I join the requests for Don’t Starve Shipwrecked and Don’t Starve Together to come to PS Vita! OMG what? I’ve been waiting for Don’t Stave Together AND Shipwrecked? Together in one bundle? OMG OMG I’m soooooooooooooo excited. WOW this is so awesome. My wife and I LOVEEEEEEEE Don’t Starve and bought Reign of Giants also. Thanks for the love! We’re super excited to get this in to everyone’s hands! This just made my day. I have purposely avoided just about everything about Shipwrecked (I did youtube it just to check it out for about 30 seconds, saw the trailer, fell in love and then never watched anything again). I’m really super excited for this and at an amazing price. I have Don’t Starve and Don’t Starve: Reign of Giant’s but I don’t ‘own’ them as I got them on PS+. Is it safe to assume if we don’t renew with PS+ we will still be able to play these games? You’d have to confirm with Sony, but I do know we intend on giving people the MEGA PACK discount who own the original via PS+. I do believe it would need to be an active subscription to purchase it at that price. The price will change automatically on the PSN for you when you view the MEGA PACK store page and you qualify. I heard a rumor of a physical release…is that a thing????? We don’t have any info on a physical release at the moment, but if that happens we’ll let everyone know! If you follow us on twitter or Facebook we’d for sure be posting about that. Are you gonna offer DST as a stand alone purchase as well? I purchased DS RoG pack and then purchased SW as DLC. So I don’t need all of it. Yes! DST is 14.99 on its own. However, for people in your situation that’s why we made the MEGA PACK 60% off for past owners! you will get it for 10.79 making it almost $5 cheaper than just buying DST on its own and get the two premium themes for free if you don’t have those already. Thank you Corey for taking the time to reply. Will purchase day one! Absolutely! I actually really love doing these PS Blog posts and replying to all the comments and questions. We’ve got a lot of love for Don’t Starve and we appreciate it a lot. Hype to get the new version in to everyone’s hands! If I own Don’t Starve: Giant Edition am I eligible for the MEGA PACK discount? Yes! As long as you have the original version of the game on your account (DS, DS Giant Edition, or DS from PS+ and you’re still subscribed) you’re eligible for 60% off MEGA PACK. This time, yes. DST was approved for a Platinum Trophy. Any word on cross platform play? PS4 and PC like rocket League or Paragon! That would be great. There’s no word on if we’ll be able to do this. It’s something we think would be cool to do, but we’re not sure if it’s something that will ever happen due to how the two versions work server wise, player account, items / economy and general red tape. So currently no plans, but if it ever happens we’ll let everyone know. Hi! I am so addicted to Don’t Starve! Thanks for the good (and brutal) times and I will definitely be grabbing this mega pack. Thanks so much! Hope you enjoy the newest release, and of course, don’t starve. Aw man, I just bought shipwrecked yesterday and now I find out I could have gotten it as part of this bundle. Do you get additional % off if you have the dlcs already too? The bundle discount is dependent only on owning Don’t Starve, but the good news is, you will still get all of the premium animated themes, and DST (and Reign of Giants if you don’t have it), for less than just buying DST! I loved Don’t Starve om my vita, but I couldn’t justify buying Shipwrecked for PS4 when I didn’t have Reign of Giants for that system. So it’s been a while since I’ve played the game as a direct result of this. However, being able to get both expansions plus Together for $10 is super convenient and an easy yes from me. Definitely picking this up ASAP. Can’t wait, even though I have no one to play it with. When I was abandoned and starving in the middle of the woods, I remembered Don’t Starve survival tactics and quickly became a master at not starving! 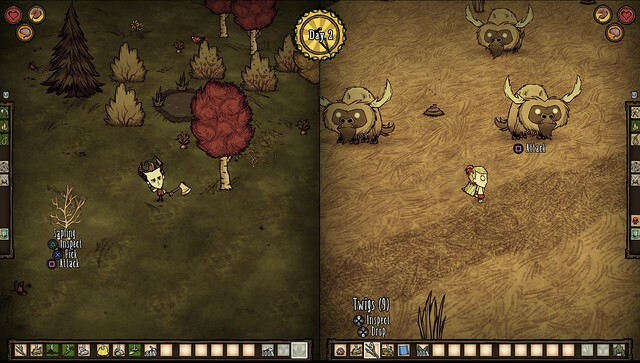 This is really cool, but where is Don’t Starve Pocket Edition Android? In the works! No exact release date, but it’s super close! We’re just finishing up the private beta and we’ll even be showing it at PAX West. Expect more details very soon. Will there be an option to save? If so…how will it work? Saving works very similar to classic don’t starve, but it’s held on the host console / server. It’s a server wide save file. As long as the host is playing everyone can connect / jump in and resume their save. Amazing news. Don’t Starve was great when it first launched and has only gotten better since then. I wanted to ask if the characters from Shipwreck (mainly Wilbur) will be in Don’t Starve Together? Thanks so much! Currently, everything in Shipwrecked is just in Shipwrecked. However, we’re looking at if it’s ever going to be possible to integrate some or all of Shipwrecked in to Don’t Starve. There’s some technical hurdles we don’t know how to overcome yet, but we think it would be super fun to sail the seas with friends. If it ends up happening we’ll let everyone know, and I may be back on the PS Blog shouting about it :P We’ll see! How long will the bundle be available? Is it a limited time offer? What if we have Dont Starve and expansion how much would it be ? Still 60% off. Basically if you own everything in the Mega Pack already, you get $5 of DST VS buying it solo. Its 14.99 standalone, but since you get the mega pack discount its 5 dollars cheaper to get the mega pack with the 60 percent off. I’d love to play co-op, it says “DST will support up to six players online and for the first time ever, support split-screen couch co-op both locally and online”, does that mean I can play 4 co-op locally and 2 other can join online? Or I have to be online alone, and join other player? What is the maximum number of player can join for offline local co-op? Only 2 players can play local on a single machine. We tried more but honestly splitting a single TV screen in Don’t Starve more than 2 ways was really gross with all the UI etc required to play. You can play online, or fully local when you co-op. If you play online and you are split screen, you are essentially taking 2/6 possible player slots on any given server. Awesome, can’t wait… Please advise though if there will be an update for RoG & SW to fix various bugs since the SW updates? Corey Rollins, you mentioned that DST will have a Platinum trophy (Any chances of a trophy list teaser? ), and most likely be a completely standalone application on the PS4, unlike Shipwrecked/RoG, but will anything from the normal Don’t Starve game carry over? If we unlocked characters like Maxwell or Wes, will we unlock them on DST? Or will we have to do something else to unlock them? Or will they simply be unlocked from the start? Also, please no accomploshrine-esque trophies. Please? So i am the first to say something negative, but I just bought Shipwrecked 3 weeks ago, its pretty good but I didnt have much time to play. If you had mentioned we could get Shipwrecked + Together for just $9.50 I would have of course preferred to do that… Is there anything that could be done about it like a free Together code or coupon to get the complete bundle for like $5? I’m a bit bummed since I just bought my girlfriend Shipwrecked. She already has RoG, SW, and the themes, but still has to pay $10.79. As much as she loves this game, it’s worth it.. but can’t help but think the timing was poor since I just paid $5 for SW this month. What if you own the beta? Will it count you owning the game? Hello, just a couple of questions? 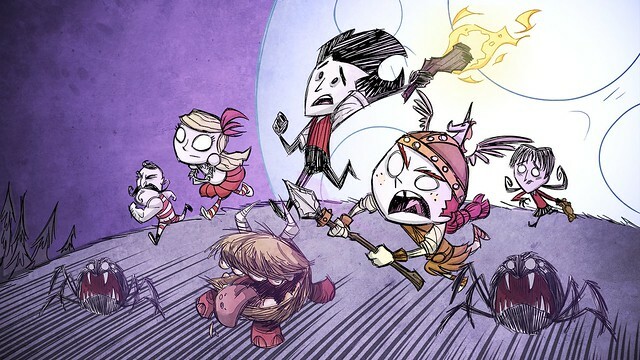 1.-Is Don’t Starve Together: Console Edition a DLC expansion for the original or a new game altogether? 2.-What about fans like me who already own the original Don’t Starve, and both Giants and Shipwrecked expansions? would there be a discount for buying only Don’t Starve Together? In. Been waiting for this ever since Don’t Starve came to PlayStation Plus; absolute loved it, and was thirsty for more. Yes!!! My wife was just asking me about this last week as we were passing the controller back and forth playing Shipwrecked! We’re so excited!! !